← Hey there, wild strawberry. I picked up a yellow flesh watermelon from the farm as part of our share yesterday. 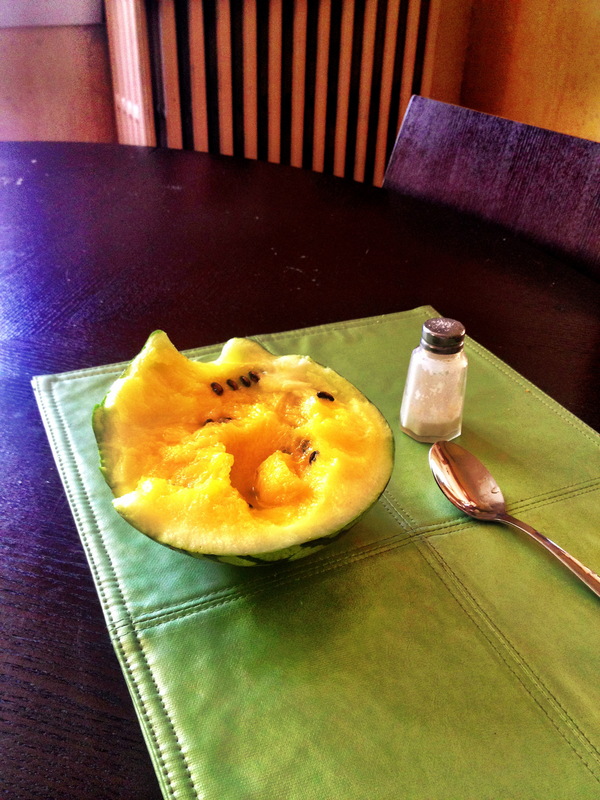 I’m the only one here who eats melon (is there a genetic mutation that makes melons unpalatable? – otherwise I can’t explain it). So I had myself a snack. In the midst of basil season, I’m not making pesto this summer. Pine nuts are just too expensive, for one. Are there any substitutions for them? I seem to remember coming across a recipe for a pistachio-arugula pesto that I filed away in my mental to-try folder, but that’s not answering the need. Walnuts won’t do for the other reason I’m not making pesto: the wife isn’t majorly into nuts to begin with. So I’m making pistou instead. Which is to say, I making pesto without pine nuts. Pistou is apparently a Provencal basil sauce of garlic, cheese, and olive oil, so pesto without the pine nuts, but it seems a bit extravagant to invoke a whole alternate heritage for what amounts to eliminating the pine nuts and amping up the garlic. Here‘s the recipe that I started with, but it’s no rocket science. And when I say amping up the garlic, I mean I’m using a hell of a lot more garlic than this recipe called for. It’s like a garlic bomb it’s so awesome when you do it like that – just give it a little while for the sharpness to mellow. And, you know, put it in soups and on roasted new potatoes. And of course toss it into pasta. Salad dressings, too. That, and I’m looking forward to my first basil gimlet of the season. And, finally, another butterfly, a Gray Hairstreak. This one is small and easy to miss. Think of that and their considerable and broad distribution from Colombia to Canada. A massive invisible nation dwarfing all others, hovering only eighteen inches above the ground of the contiguous land masses of North and Central America. In the last post I compared my new interest in identifying butterflies with love, and in a few upcoming posts, I’d like to explore a broader, and a bit more technical, philosophical and naturalist background to the comparison. But for the moment, I’ll just say that what turns my head to pursue a flash of color fluttering above the grass is very much like the experience of love. And then to patiently pursue the butterfly until it comes to a rest – which can be at times fifty to a hundred yards, man; to peer intently at it to identify as many characteristics as my inexperienced eye can before it flies away; and then patiently to differentiate and situate it amongst a variety of potential beloved. This one was a tiny pale flake, and without the desire to know butterflies a bit more intimately, I would have simply pegged it the ubiquitous Cabbage White and moved on. Now not only do I know the Hairstreak, I’m also aware of its similarity to the Eastern Tailed Blue, and the Summer and Spring Azures. A world in which to place it, and in which to attempt to place myself. And my eyes thereby acquire experience.